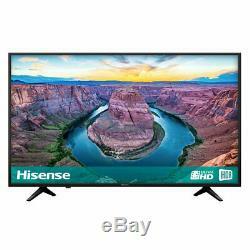 Hisense H50AE6100UK 50 Inch Smart 4K Ultra HD TV With HDR, Freeview Play Black. Smart 4K Ultra HD with upscaling TV. Freeview HD with Freeview Play. 3 HDMI & 2 USB ports. Settle in for an epic move marathon or binge your favourite boxsets in stunning detail with this 50 inch Hisense LED TV. Lose yourself in the action thanks to cutting edge 4K Ultra HD upscaling that bring the small screen to life with jaw-dropping visuals. HDR technology improves the image quality even further with true-to-life colours and contrast for an unrivalled sense of realism and depth. Youll be spoilt for choice with the smart TV features, including access to all your favourite apps and on demand services - or opt for 1 of the 70 Freeview HD live channels. And if that still isnt enough, there are also 3 HDMI and 2 USB ports, so youll have plenty of options for consoles and other external media devices. TVs > 4K ULTRA HD. Order before 1pm for same day dispatch. Non-essential accessories cables, adapters etc. Dimensions: 1127 x 718 x 244 including stand (W x H x D in mm). 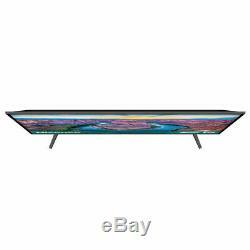 Type: 4K ULTRA HD TV. Resolution: 3840 x 2160 (4K Resolution). MP3 music(mp3 aac wma wav). Power Consumption: 130 watts On mode. Vesa Wall Bracket Mounting Size: 200 x 200. This product has no reviews yet, however see what our buyers say about our other products.. Please confirm with our customer service team first before placing the order. For orders delivered via DPD, deliveries will be attempted twice, with a calling card left each time. Large Screen orders will only be attempted on one occasion. 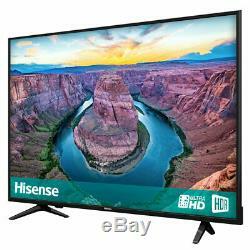 Large Screen TVs & Plasma Orders (Over 42 & Plasma). If the item was originally delivered by Initial City Link / DPD / Specialist courier, Electrical-Deals will arrange a FOC collection at your choice of UK Mainland address, we reserve the right to ask you to return the item at your own cost for non-faulty items. All return items must be in their original and unused condition, complete with all accessories supplied and original packaging. Faulty Products - After 60 Days (Excluding cosmetic/accidental damage or customer misuse). You are responsible (including costs) for returning the item to us via a trackable method. Return the item to us at, Electrotec, Manchester Road, Hollinwood, Oldham, OL9 7AA. The item must be securely packaged, preferably in the original packaging using the inserts supplied. We will not be held responsible for any loss or damages that occur whilst in transit. Upon receipt of your item we will provide a FOC repair including any mechanical parts, if in the unlikely event the unit is beyond economical repair we will provide a like for like replacement. When we have repaired your item we will return it to your choice of any UK Mainland address FOC and contact you beforehand. Our FOC repair service excludes cosmetic/accidental damage and customer misuse. The above policies do not affect your statutory rights. Our address for collections is; Electrotec, Manchester Road, Hollinwood, Oldham, OL9 7AA. You may also be interested in.. Keep in touch for our latest special offers and competitions. 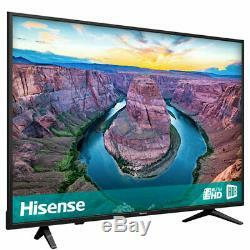 The item "Hisense H50AE6100UK 50 Inch Smart 4K Ultra HD TV With HDR, Freeview Play Black" is in sale since Tuesday, April 2, 2019.